Sitting between YouTube and its audience, there’s a new industry. Its business is to maximise the impact of online video talent. 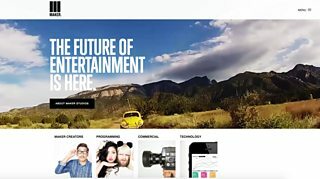 The multi-channel networks (MCNs) take a share of what YouTubers earn from ads played around their content and, in return, use business and marketing skills to turn them into stars with multiple sources of revenue. Today, that revenue doesn’t just come from YouTube, and not just from advertising either. Complex sponsorship and merchandising deals bring in serious money. Have you seen the new Zoella vanity case? Where all this is going was under discussion at a Royal Television Society (RTS) event in London. A panel of industry luminaries – mostly MCN entrepreneurs – offered their views, although they didn’t pretend to know all the answers. Ashley Mackenzie, the CEO of Rightster, a large British MCN, admitted he couldn’t understand why teenagers spend so much time watching YouTube. Rightster has over 200 staff and offices in more than 10 countries. If he doesn’t know, who does? 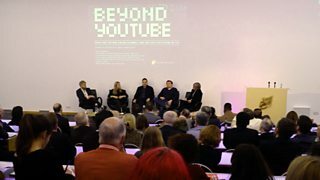 But as a comparative veteran of the industry, Mackenzie was optimistic, describing business opportunities multiplying beyond YouTube (the title of the RTS event): there are now options, he said, we have entered “a genuine multi-platform era”. It’s not just that alongside YouTube there are other video platforms, including Facebook, Twitter and Snapchat. Now well-funded brands are eager to tap into the MCNs’ access to the younger audience. The growing industry has attracted the attention of big media names, as Dan’l Hewitt, Managing Director UK of Maker Studios will testify. Two years ago, Maker, which originated in the States, was bought by Disney for a figure reported to be as much as a billion dollars. The view on the panel seemed to be that anyone over 25 is lost when it comes to online video. For Barry, that presents an opportunity. She said they’d found that only half their audience watch online video every week: her new digital service aims to give them “simple, easy to understand curation” of videos – so they too can enjoy casually browsing categories like “quick laughs” and “food and drink”. That we’re entering a new world was demonstrated by the success of James Kirkham’s Copa90 global football network, “the voice of fans”, an MCN that also doesn’t mind being known as “the Vice media of football”. Kirkham’s view is that coverage of football hasn’t changed much in 50 years – still featuring “four suits” in a studio, he complained. For his audience, any distinction between TV and online is becoming “less relevant” and for a modern media business, “having a social strategy that’s different from your mobile strategy is absolute lunacy”. 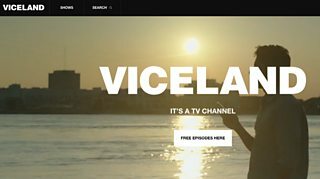 Just when the RTS audience thought it was starting to get its head round the fragmented online, mobile, bite-sized, ad-funded, star-making world, someone brought up an awkward fact: Vice, the producer of original bite-sized journalism, having morphed from a magazine to a prosperous online video business, has just opened Viceland, a television channel. Yes, lots of videos shown one after another on a television; just like, well, television. So what’s that all about? Not so much back to the future as forward to the past. Nobody knows anything. In a second post next week, we’ll be looking at research that was presented at this RTS event, showing how revenue from online video is overtaking that from both free and subscription television.